Green Lantern #201 VF (8.0) Green Lantern Corps Begins!! This is a scan of the actual comic. 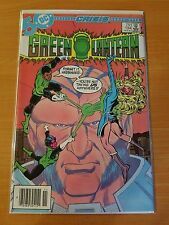 Green Lantern 90-224 Vf-Nm Very Fine-Near Mint. Shipped with USPS Media Mail. The pictures provided are of the actual books for sale. I have been a comic book collector for 35 years, and most of my books were read once (or not at all) and bagged and boarded. 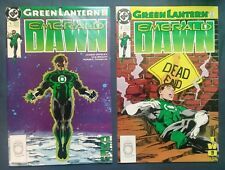 LOT OF 11 GREEN LANTERN COMICS. #187-191, 193, 194, 196-198, 200. COMICS AND COLLECTIBLES ! THE JUDGE! All my comics and Graphic Novels are used. I try not to do to many low grade unless they are older or bigger keys. These are not perfect issues. None are destroyed. I do not do this professionally tho. ALL COMICS ARE BAGGED AND BOARDED. Add. 75 cents per book. YOU GET THE EXACT BOOKS IN THE PHOTO. YOU GET THE EXACT BOOKS IN THE PHOTO. Graphic novels and trade paper books count as 8 comics. A very Nice Comic with a 1/2" back cover fold line on the top left corner! Origin recap of Hal Jordan as Green Lantern! In my estimation the book ranges in "NICE" (6.0) FINE to (6.5) FINE condition. Moderate wear to cover, spine, corners & edges. Book has minor age discoloration/staining/soiling and both right corners on back cover have super tiny tears. Guest-starring Green Lantern (Guy Gardner) and Green Lantern (John Stewart). Hal races to the planet OA to save the displaced Earth cities. But does even the Green Lantern have enough will power to defeat a Guardian gone mad?. The Comic is in Very Fine To Near Mint Condition, see scans for the exact item you will receive. I grade based on the CBCS Guidelines & they grade very fine to near mint as. Overall an above average copy and still very collectible. Cover by Bright and Klaus Janson. Hal Jordan.as a young boy, he watched his father make aviation history before tragedy struck. As an adult, he dealt with that tragedy. ----- from DC from 1989----- ------ -------. 1st appearance of the Javelin! In my estimation the book ranges in "NICE" (7.5) VERY FINE- to (8.0) VERY FINE condition. Very moderate wear to cover, spine, corners & edges. Believe any/all flaws to be very minor/hardly noticeable and does not distract from the overall eye appeal of book. I.D. revealed! In my estimation the book ranges in "NICE" (7.0) FINE/VERY FINE to (7.5) VERY FINE- condition. Very moderate wear to cover, spine, corners & edges. Book has slight age discoloration. This 1984 issue of DC Comics, Green Lantern # 173 is in Near Mint Minus Condition! A very Nice Comic Book! Green Lantern # 173. Green Lantern #177, Near Mint Minus Condition! This 1984 issue of DC Comics, Green Lantern #177 is in Near Mint Minus Condition! A very Nice Comic! Green Lantern # 177. Crisis on Infinite Earths crossover. Guy Gardner intends to use the Shark to assist against the Anti-Monitor. - ------------------------- -------- --- ---------------------------------------------------------- -- ----- -- ------from DC from 1986 ------------------- ---------. Guest-starring Green Lantern (Guy Gardner) and Green Lantern (John Stewart). For years Hal Jordan has been one the DCU's best and most stalwart champions for justice. Plus, where has John Stewart been. Rocket Reds vs John Stewart, Hal Jordan, Arisia, Ch'P, Guy Gardner, Kilowog, Katma Tui, Rocket Red. - ------------------------- -------- --- ---------------------------------------------------------- -- ----- -- ------from DC from 1987 ------------------- ---------. It had to happen.Hal Jordan and the obnoxious Guy Gardner set aside their power rings and face off in a no holds barred Green Lantern duel to settle their differences once and for all. Guest-starring Green Lantern (Guy Gardner) and Green Lantern (John Stewart). Hal continues to try and find a place in the world that doesn't include him being the Green Lantern. Guest-starring Green Lantern (Guy Gardner) and Green Lantern (John Stewart). ----- from DC from 1990 ------ ------ -------. Green Lantern # 194 - Hal Jordan & Guy Gardner Battle. This 1985 issue of DC Comics, Green Lantern #194 Featuring Hal Jordan & Guy Gardner Battle is in Near Mint Minus Condition! A very Nice Comic! CRISIS ON INFINITE EARTHS cross-over! In my estimation the book ranges in "NICE" (6.0) FINE to (7.0) FINE /VERY FINE condition. Very moderate wear to cover, spine, corners & edges. Faint wrinkles bottom right corner and book has minor age discoloration/staining/soiling. From DC from 1986 ------------------- ---------. A number of Green Lanterns take on Dr. Polaris, Sonar, and Dr. Ub'x. A key, early Blackest Night. Blackest Night. Credits Script: Alan Moore Pencils: Bill Willingham Inks: Terry Austin. Characters: Katma Tui; Guardians of the Universe; F-Sharp Bell (a blind Green Lantern). Hal Jordan discovers his newfound power ring has a weakness.and so does the life of a super-hero. ----- from DC from 1990. We will take great care in processing your order. ----------------------------- ----------------------------------------------check out the pic for a great look-----------------------. GREEN LANTERN VOL 1. # 173, 174, 175, 176, 178, 179, 180, 182, 184, 185. Comics in this condition have an aggregate of defects so extensive as to render them all but uncollectible in most cases. Even a poor copy, however, can be sought by readers and even collectors when better condition copies are not available at affordable prices. 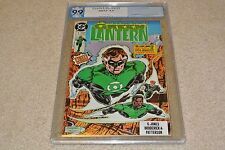 DC COMICS GREEN LANTERN #201 1986 CGC 9.6 WP 1ST KILOWOG COVER G. LANTERN CORPS. Shipped with USPS Priority Mail. What you see is everything you will get. Green Lantern #v3 #48 CGC 9.8 (W) 1st appearance of Kyle Rayner. Green Lantern #v3 #48 CGC 9.8 (W) 1228393023 . We are sorry for any inconvenience. For larger credit card orders, proof of identity may be required. International credit cards are NOT accepted. The world's largest source of trading cards and collectibles. 1st appearance Kilowog. Signed by Joe Staton. You will get the exact book in the photo below. Just search for Comics To Astonish on the world wide web. From DC from 1991 ------ ------ -------. We will take great care in processing your order. ----------------------------- ----------------------------------------------check out the pic for a great look---------------------------------------light pencil on cover------------------------------------------------------------------------ ----------------------------------------------------- - grade vf-. DC Comics Green Lantern issues #194 and #195. Books are in good shape. Bagged and board. Green Lantern #19 (1991) CGC 9.4 Signed by (Late GL Creator) MART NODELL HTF!! 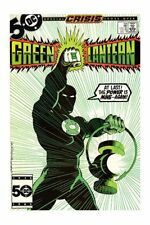 Green Lantern #19 CGC 9.4 Signed by (the Late Original Green Lantern Creator) Mart Nodell. Newly CGC'd / White Pages /50th Anniversary Issue w/Mart Nodell Art / Beautiful Green Ink Signature! ONE-OF-A-KIND, RARE ITEM! Newsstand Variant. Crisis on Infinite Earths Crossover. Green Lantern #195.